If you’re confused about what CTRL+F is, you are not alone – according to Dan Russell, a search anthropologist at Google, 90% of people do not know how to properly use CTRL+F to locate a word in a document or on a webpage. This tool will save you time and the embarrassment of missing a keyword or phrase that should’ve been replaced. Whether you are using your browser or your word processor, CTRL+F will speed your work up immensely. Ctrl+ F works wherever you are: web browsers (Google Chrome, Firefox, Safari, etc.) word processing programs (Microsoft Word, WordPerfect, etc. ), or PDFs viewers like Acrobat Reader. Pressing the keyboard keys “CTRL” (“Command” on a Mac) and “F” at the same time will help you find any specific phrase, clause, or word you are looking for by typing them into a box that appears on your screen. The “find” box may appear in different locations on the screen depending on which program you are using – but it will always appear. When searching through an online document or a webpage for specific mention of a word, phrase, or number, CTRL+F can save a lot of time. Simply press the keys CTRL and F and enter the desired term, phrase, number, word, or clause into the Find box that appears. In Internet Explorer your search term will be highlighted and each time you select “Find Next” the search will move through the document highlighting the usage of the designated word, number, or phrase. 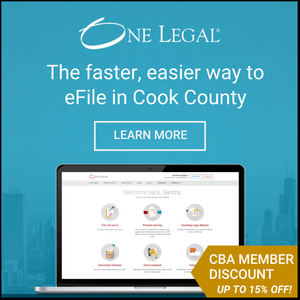 For instance, say you need to find the contact information for a specific judge in the Criminal Division of the Circuit Court of Cook County, but you only know that his first name is John. Go to the court’s website listing of judges in this division, and then you can use CTRL+F to accelerate your search. Enter “John” in the search bar and press <Enter>. The search will bring you directly to any mention of “John” on the page. Pressing <Enter> again will bring you to the next entry of “John” on the page if there is one. When working in Microsoft Word, CTRL+F opens the Navigation pane and you can search for a word, phrase or number. You will see all of the instances of your search term appear in the Navigation pane with the word in bold and can quickly jump to that portion of the document. Take it one step further and use the Navigation pane to find a word or phrase – and then replace it! From the Navigation pane click on the “carat” (arrow) to open a toolbar with more options, including Replace. There may be cases where you do not want to “Replace All” but only “Replace” some. For example, a brief cites Wickard v. Filburn in several locations, however sometimes the citation is not as appropriate as that of say, Horne v. Dept. of Agriculture. 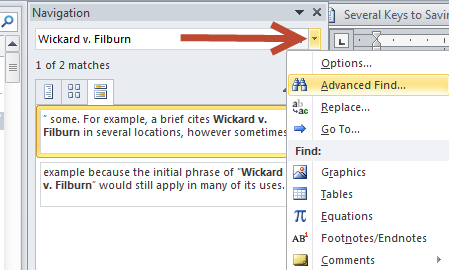 “Replace All” would not work in this example because the initial phrase of “Wickard v. Filburn” would still apply in many of its uses. Instead, select “Replace” and let the find feature bring you through the entire document. When you find items you would like to replace, select “Replace” again; when you find items you want to leave as is, select “Find Next” and move on. Once you get comfortable using CTRL+F in your searches and writing, you’ll wonder what took you so long to learn this important skill.